BrainChip Acquires French Based Computer Vision Technology Company -- Spikenet Technology :: BrainChip Holdings Ltd.
ALISO VIEJO, CA -- (Marketwired) -- 06/30/16 -- BrainChip, Inc., a wholly owned subsidiary of BrainChip Holdings Ltd (ASX: BRN), a developer of a revolutionary new Spiking Neuron Adaptive Processor (SNAP) technology that has the ability to learn autonomously and associate information just like the human brain, has signed a binding term sheet to acquire Spikenet Technology ("Spikenet"), a revenue producing, Artificial Intelligence (AI) company that is a leader in computer vision technology based in France. Spikenet, based in Toulouse, France, is an "Artificial Vision Specialist" established in 1999 that has developed a disruptive pattern recognition technology called SNVision. SNVision has been successfully commercialized into a suite of software products that are currently being sold. Spikenet customers include Bordeaux Airport, the French Interior Ministry, Shanghai Police, and numerous Las Vegas casinos. The team at Spikenet is headed by Mr. Hung Do-Duy, who will continue in this role. SNVision is a software based spiking neural network that learns any visual pattern in real-time with no intensive training and very few image samples. It then detects and recognizes the learned patterns in still images and in video streams. SNVison and BrainChip's SNAP are extremely compatible and allow the combined group to target a wider audience with a suite of hardware and software products. The combined team has already identified several opportunities. The security product is configurable and has wide ranging uses. It can be deployed for example on mine sites, hotels and entertainment venues, banks and office buildings. It is currently in use with Spikenet customers worldwide. Identifying player or dealer mistakes. The market for this product is significant and worldwide. Spikenet gaming solutions are in commercial use in several gaming venues. The acquisition and integration of Spikenet, its technology and its teams creates a dynamic and highly valuable business division inside BrainChip. Over the coming months the newly combined technical team will integrate SNAP into the Spikenet core product lines to significantly enhance its performance and capabilities. The newly formatted products will be a driving force behind a major sales and marketing campaign to existing and potential new customers in the computer vision sector. The combined company has substantial geographical reach and is capable of selling, deploying and supporting Computer vision hardware and software solutions across all major geographical regions. The combination of fast, autonomous learning hardware in BrainChip's SNAP technology and Spikenet's procedural capabilities creates a computer vision product that is compact and faster than deep learning networks. Deep Learning networks don't actually learn; they are trained on a supercomputer to perform a single task. Principal computer video processing systems compare pixels to identify a person or find an object, and suffer from processing speed issues. 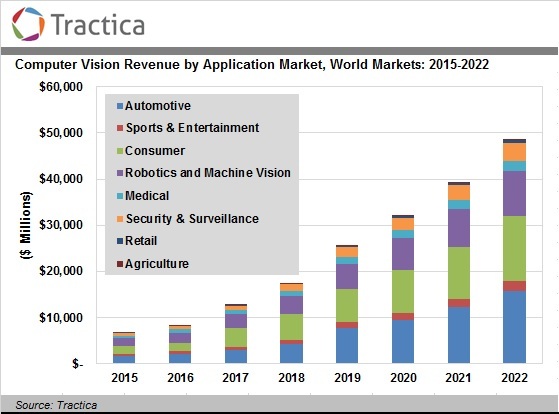 According to an industry research report by Tractica, the global market for computer vision hardware and software will increase from $6.6 billion in 2015 to $48.6 billion annually by 2022, at a compound annual growth rate (CAGR) of 32.9%. The market intelligence firm anticipates that approximately three-quarters of the revenue opportunity during that period will derive from hardware, with the balance of the revenue coming from computer vision software and services. The acquisition of Spikenet will accelerate BrainChip's ongoing plan to deploy a range of complete products suitable for delivery into a wide range of business sectors. BrainChip has identified the Unmanned Aerial Vehicle (UAV) market for an onboard vision based system and is currently engaged in the development of a drone based vision system that can detect and navigate to, from and around identifiable objects detected by such a system. The system once completed has numerous identified end users. Sports events and arena advertising, and many more. Spikenet's highly talented technical and sales teams will be retained. The team has been in place for over 10 years and contains some of the best minds in Neural computing in Europe and the USA across various disciplines. BrainChip's CEO, Peter van der Made, said: "We originally considered Spikenet as a technology partner and potential licensor of SNAP. Within a short period, we realized our deep synergies meant an acquisition would provide greater benefits to BrainChip's shareholders. "We have been very impressed with Spikenet's management and innovative computer vision capabilities. Our technologies are a natural fit and SNAP, with its established rapid Autonomous Visual Feature Extraction capability, will give Spikenet's existing programs a turbo boost and make the product attractive to a wider audience." Dr. Simon Thorpe, the founder and co-inventor of the Spikenet Technology, said: "I'm extremely pleased to see the two companies coming together via this acquisition. I believe BrainChip is the perfect combination for us. They've got the expertise and the industry contacts." Spikenet's President, Hung Do-Duy, commented: "Joining forces with BrainChip will definitely help both companies' ambition to write a new and exciting story where in little time we can be the leaders in the space of Neurocomputing and the Artificial Intelligence." BrainChip looks forward to providing shareholders with further updates regarding the acquisition and future plans for the Computer Vision division of the company. Spikenet, based in Toulouse, France, is an "Artificial Vision Specialist," using Spiking Neural Networks to create superior computer vision solutions. Spikenet Technology provides tools and programs that are able to rapidly learn to recognize objects, people and anomalies. Spikenet's current products have been sold in the security, transport, media, industrial vision, and gaming sectors. For more information, please visit www.spikenet-technology.com.